I've seen these made with broccoli but raw broccoli is not my favorite and it doesn't agree with me so I made my own version. I peeled 2 cucumbers and sliced them up and then laid them out in a tree pattern. Then I decorated with cherry tomatoes, carrots, and bell peppers. It took me maybe 15 minutes to make the whole thing. I served it with guacamole and some ranch. Nom Nom. 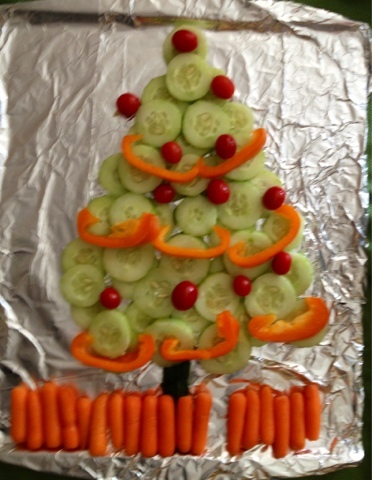 What's your favorite healthy holiday dish? I'm totally going to do this! :) Cute.